Diana and Ben were getting married in the quaint town of Benton Harbor in Michigan, where the bride's family has spent many summer vacations. 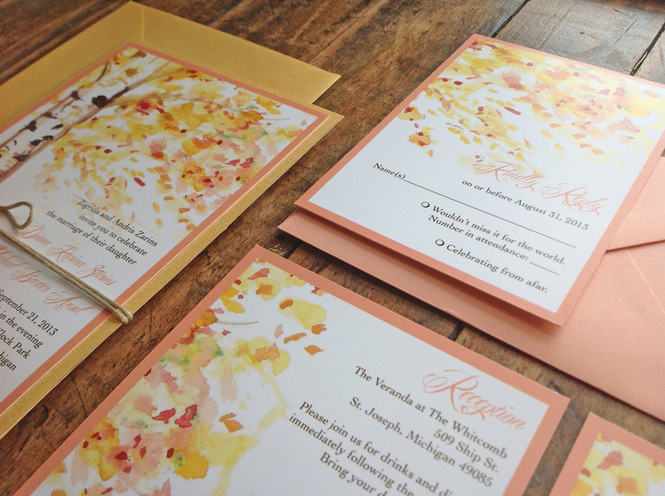 Their wedding was planned to take place on the beach, and they wanted soft colorful invitations. It was also important to the bride to incorporte a birch tree, which was significant to her family heritage. Using gouache, a fanciful birch tree design was created that followed throughout the suite. The invitation was mounted on gold shimmer card stock that had a pocket on the back that included the reply card and a two sided information card. The invitation suite was then tied with hemp twine.